Alphabet’s Google has for the first time introduced liquid cooling in its data centers to cool the latest processors that underpin AI capabilities in everything from the latest Gmail updates to upcoming capabilities in Google Photos. 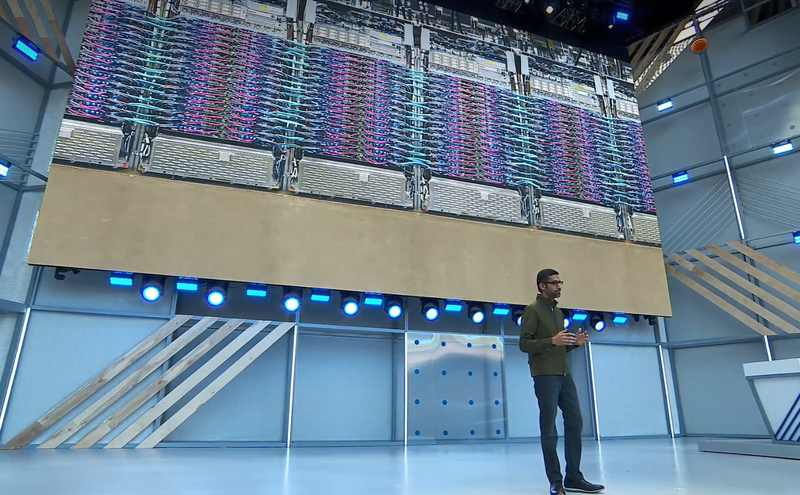 Alphabet CEO Sundar Pichai announced the next-generation TPU 3.0 chip in his keynote at the company’s annual I/O conference in Mountain View, California, Tuesday. Pichai announced first-generation custom TPUs at I/O in 2016. The company has since started offering access to TPUs as a cloud service for external customers, in addition to GPUs, which are commonly used to train neural networks for AI applications. Google’s chief executive didn’t reveal much detail about the latest-generation TPUs or how the cooling systems for them are designed, but judging by the photo of TPU 3.0 he displayed during the keynote, the system brings chilled liquid directly to the chip via thin tubes. Neural networks are trained using highly dense clusters of GPUs or, in Google’s case, TPUs. These are extremely powerful processors that consume a lot of power. Because the clusters are so power-dense, they require cooling approaches similar to those used in the supercomputer industry, such as bringing liquid directly to the chip, instead of the more traditional approach of cooling by pushing cold air through the servers.